I got an interesting email the other day from a person who lives in the Bay Area of California and plans to move to Knoxville. He specifically said he’s interested in 1 Riverwalk. 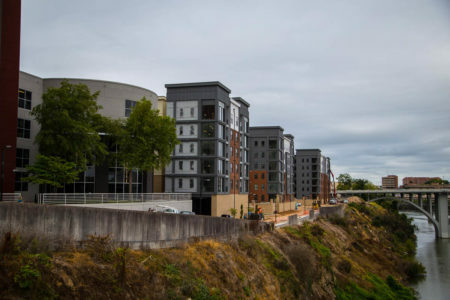 It took me a minute to figure out that the apartments nearly finished on the other side of the river have changed names from the one I’d previously used (Riverwalk at the Bridges). The project was announced in 2013, I first wrote about it in 2014, and most recently published photographs and an update last winter. Our prospective citizen from California asked if I would be willing to take a couple of photographs of the project from each of the bridges. The purpose was to study the placement of units and decide where he wants to live within the building. I was happy to help, but two photos turned into a dozen, of course. The structure is completed, for the most part, and finishes are being added. 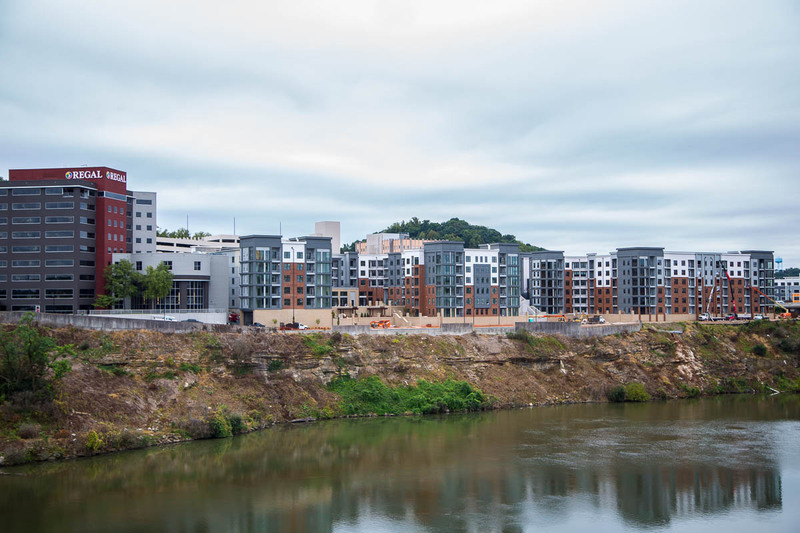 It’s quite striking to drive past at this point and the combination of it and the student apartments across Chapman at the other side of the south end of the Henley Bridge really combine to make the south entrance to Knoxville appear quite a bit different than was previously the case. I took some views of the city from the garage across the street just to show the view the units will have and it’s really quite spectacular. 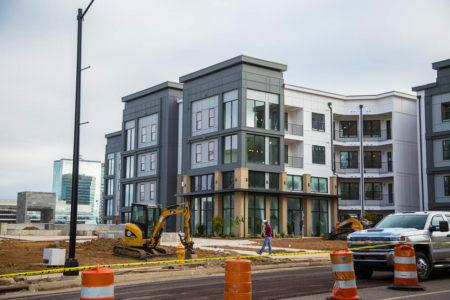 Looking at the apartments from the south side is an interesting perspective and they fit quite nicely with their new neighbor, Regal Cinemas in their newly re-skinned building. The website is now live and it appears reservations are being taken. I’d hoped to speak with the developer to get more details, but we missed each other. Hopefully, I can speak to him soon and, perhaps, get a look around inside. State of the art fitness with yoga, cardio, spinning, etc. The interior amenities, or finishes, seem nicely done, as well. The units were planned to include floor-to-ceiling windows and that makes sense for the view they’ll each have. Floor plans are available on the site and include a range of one and two-bedroom plans. The four one bedroom, one bath units range from about 640 square feet to 940 square feet. The two-bedroom, two bath units range from just over a 1,000 square feet up to 1,285 square feet. Prices are not prominently displayed, but when searching the plans, if you click, “availability,” only one unit is listed and that is a two-bedroom, two bath unit with 1,165 square feet listed as leasing for $2480 per month. It appears the lease period is flexible and “move-in date,” starts today. To think that we could have had an abandoned hospital overlooking the river from the south side, sitting empty for decades, highlights the swing the city will experience with the addition of 315 apartments filled with people living in south Knoxville, but with walking access to the city. The $160,000,000 project represents major growth both for downtown and for south Knoxville. Expect more on this project, soon, as I hope to look into it a bit more and report on new residents as they move in. 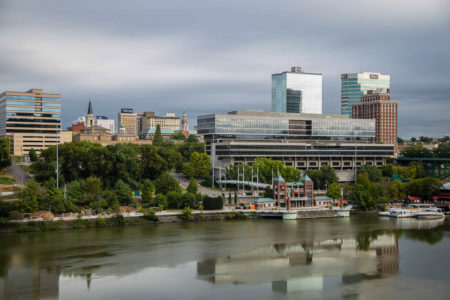 I’m certainly looking forward to seeing the foot traffic crossing the Gay Street Bridge and to the development that follows on the south side of the river. The buildings look good, but not great. I can’t imagine what they would look like without a pilot: a bunch of Evolve buildings probably, which would have been sad. Additionally, i would be shocked if they rent small 2BR units for 2.4k. That is well above the downtown market for such small units. 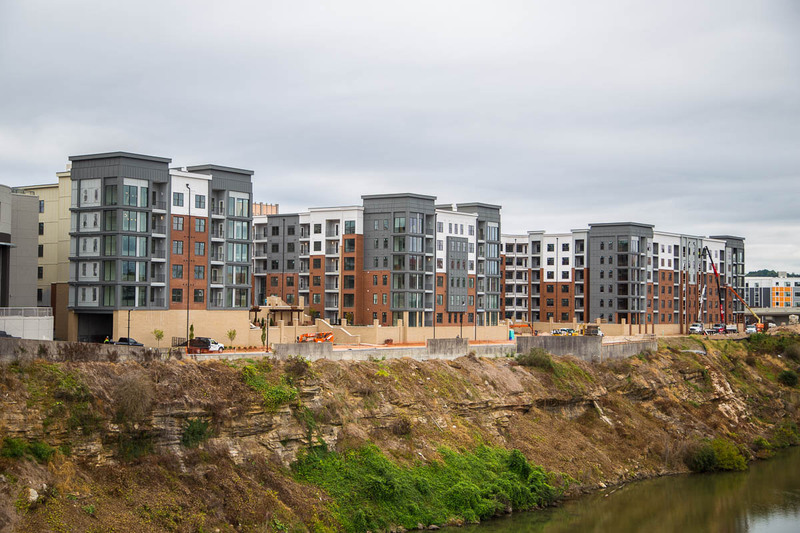 Finally, while it’s definitely a missed opportunity for an integrated mix use developed like they have at Chattanooga’s riverside; Blanchard and Calhoun apparently tried to make it happen for several years and couldn’t get it done. If they couldn’t make it work, I can’t imagine who else could have. Yeah, I have my fingers crossed that they’re not finished with the exterior because it’s such a random jumble of colors and finishes. The apartments on the other corner of Chapman Hwy. and Blount are worse. I’m all for riverfront development, but let’s put a little more thought into what we’re going to be looking at for the next few decades. You stated that the “abandoned hospital” was “empty for decades”. 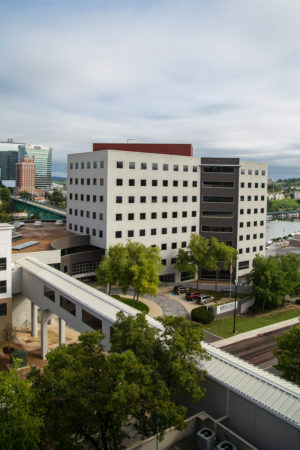 St. Mary’s bought Baptist and became Mercy Health Partners, and then soon after changed its name to Tennova. Not long after that, Baptist Hospital was closed. A quick check of local news articles showed that the closure happened in 2008. So, only five years passed between the end of the hospital and the announcement about the apartments. FYI. Your timeline is correct. My sentence may not have been the best constructed, but it did not say the hospital was empty for decades. It said we went from that very real possibility, to what we have today. I’m so excited these are finally getting done! I wonder if those abandoned old gas stations will ever get knocked down and taller, more urban looking buildings will take their place. It seems a bit silly for me to have “Downtown” end at the bridges. I can remember when down town was ran down. It was like a ghost town. I love to see all the work being put into these empty properties. I’d like to know when the city is going to address the Homeless situation we have going on under the bridge. That area stinks and is full of drugs and prostitution. Does anyone know what the plan is for that area? And a time frame? 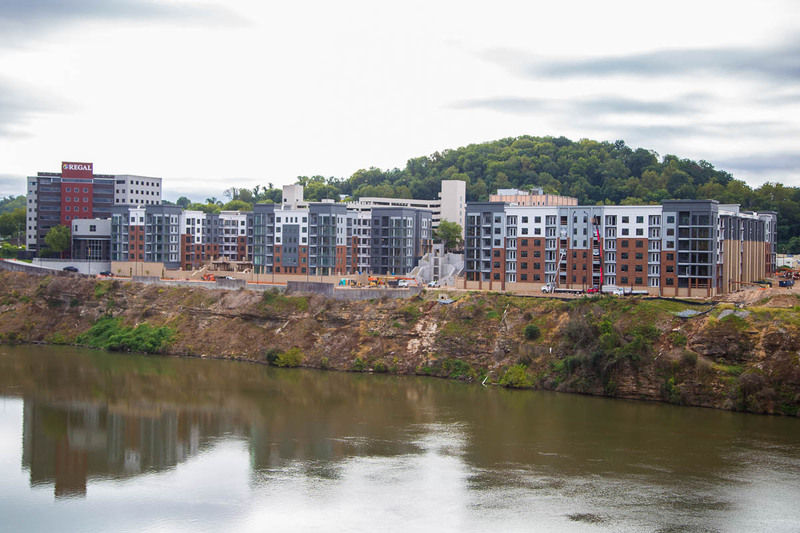 The River’s Edge Apartments are east of these apartments and sit right on the Tennessee River. The house I’ve lived in for 35 years it’s right across the street from building E. Rivers Edge seems to be a bit cheaper as a two bedroom apartment starts at about 1100. The biggest problem the Island Home neighborhood has had with these apartments is their lack of adequate parking. What was supposed to be parking for visitors along the river on Island Home Avenue is always used by the apartment residents as well as the public parking on Splendid View Drive. When the residence run out of parking spaces, they park up in Island Home which does not make some of the Island Home residents happy. The River Walk apartments look lovely. I hope they have enough parking. I’m sure that these apartments are quite nice, perhaps akin to an even more beautiful waterfront Marble Alley, but I can’t help but feel that ~$2k (what I would assume the cheapest apartment goes for) is a lot of money for prefab luxury that requires an awkward walk across a busy bridge in order to reach the far edge of downtown. I would, however, be beyond intrigued if I were a Regal employee! Hey David, It’s certainly not just you, but I’m growing a little weary of comments like this that don’t further the conversation. I don’t want to censor points of view, but comments like this one don’t really rise to that level. Please help our conversation by saying what subsidies this project received and why you think that was not a good move on the part of the city or whomever you mean. Make a point that we can understand and respond to – whether in agreement or disagreement. Illuminate the conversation or, if that’s not possible, save your sarcasm and “LOL” for FB or Twitter where being clever is more the point. I think he just preferred looking at the abandoned hospital or pile of rubble. Different strokes. 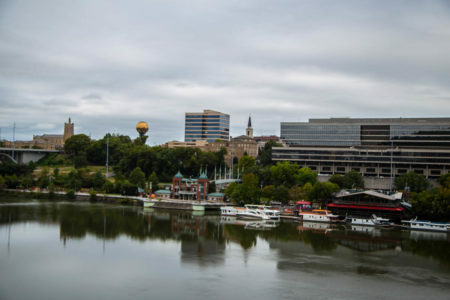 The City of Knoxville had tools available to encourage responsible development of that site or take the property altogether. IMO if the taxpayer was going to be on-the-hook for the bill then the taxpayer should have been the one to realize the profit – not just the promise of future tax receipts. I was not at all pleased with the abandonment of the Baptist Hospital site and it is something of a miracle that it did not end up like the old warehouses along Jackson (another situation which should and could have been averted had the City prosecuted the matter responsibly). So..your issue with PILOTs/Tax incentives is that it spends too much tax money…and your answer is for the city to spend even more tax money to do the projects itself..ok.
Also, the deal on “future tax receipts” is more than what you disingenuously imply. It’s not just a promise of future tax receipts, it’s also a promise that if the 275 full-time workers aren’t employed there by Regal (and thus raising the tax base in the city), then Regal would pay $1.78 million a year for the first decade, $1.95 million a year for the second decade, and $2.13 million annually in the third decade. This more than recoups that money that the city put in. Yes, it’s prime real estate, but no one was doing anything with it prior to this deal. The City made something happen when nothing was. It turned an abandoned eyesore into something vibrant and good. At 5 a.m. I’m usually drinking coffee before dashing off to work so my comments tend to be more brief than some would appreciate. I’ll attempt to refrain from my sarcastic LOL’s in the future but the basis of my underlying statement is a matter of public record AND something I’ve lamented all along. The site was originally purchased for $6.25 million (that figure has varied in reporting – I’ve actually seen as high as $8.5 million) & the City THEN purchased the remaining tower/wing of the old hospital which was not demo’ed for a cool $6 million (COK & other gov’t entities then dumped millions MORE into it so they persuade Regal to make the long distance move – from Halls to the riverfront!). None of what I am stating is a grand mystery. 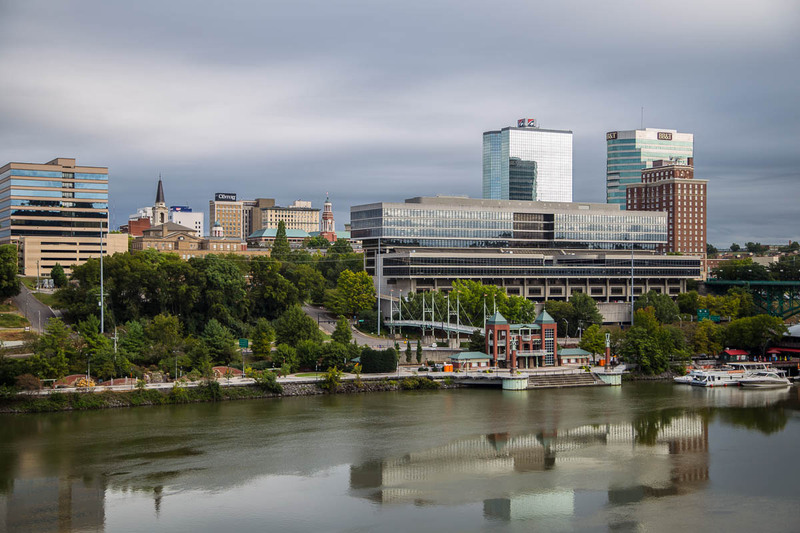 We’ve dumped MILLIONS into a piece of PRIME riverfront real estate so developers can make BANK at minimal risk. I would have preferred the City simply use eminent domain and open that side/site for public space instead of repeating the same mistake on the South side as they did on the North (by wedging the CC building into it’s current location). BTW, feel free to censor all you wish. I can assure you it won’t be the first time I’ve been barred from stating FACTS which upset or challenge the preferred narrative. While we can all be glad to see the Riverfront put to better use than an abandoned former hospital good people can and should question the use of tax incentives to advance what is, essentially, a private development of apartment complexes. The points Dave makes above about Regal keeping 275 full time employees as a condition of ‘the deal’ is an interesting point to consider. 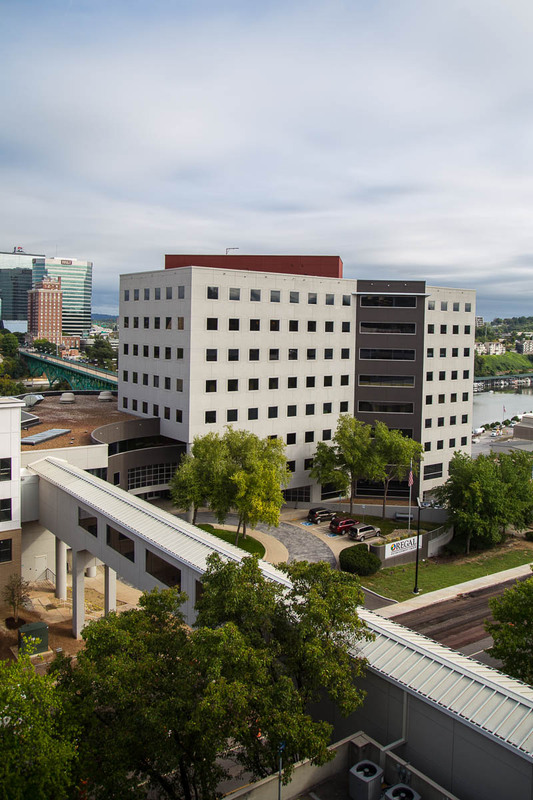 Regal was given ‘the deal’ predicated upon the belief those jobs would be high quality, high caliber, high wage, jobs associated with a major company headquarters. Such is no longer the case (and at the time ‘the deal’ was struck rumblings of the sale of Regal were already well understood in finance circles). The prestigious jobs and wages are gone, but they still get a subsidized building on an agreement calling for an average of 30 employees per floor of an nine story structure? 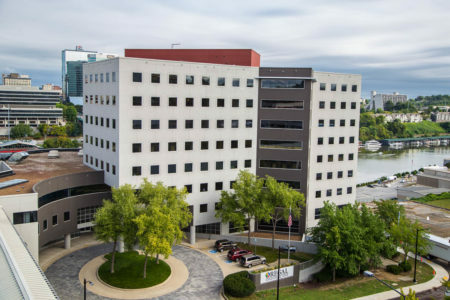 In this light ‘the deal’ looks more like a stinker for the taxpayers of Knoxville. Considering the $6 million the city paid for the tower on the site, it appeared to many to be little more than a rescue of the developer at taxpayer expense. Reports indicated Regal had previously negotiated a price in the neighborhood of $4 million for the building. Then the City got involved and the price inflated to $6 plus million. The City expected and claimed a workforce of 400 or more, but only had claw-back provisions for 275 employees. The City also committed to various improvements to the Regal building bringing the city contribution to a reported $9 million dollars. More taxpayer funds from various sources would add an additional $6 to $7 million dollars in public cost of the project. It is not clear if Regal is meeting the requirements of the lease which call for the tower to be used as its primary corporate headquarters. 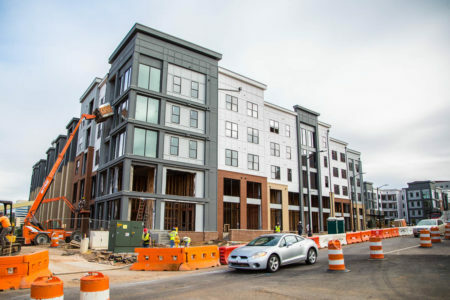 It is equally unclear if the City has invoked rent increase provisions of the lease or noticed Regal for any non-compliance issues with the underlying agreement. 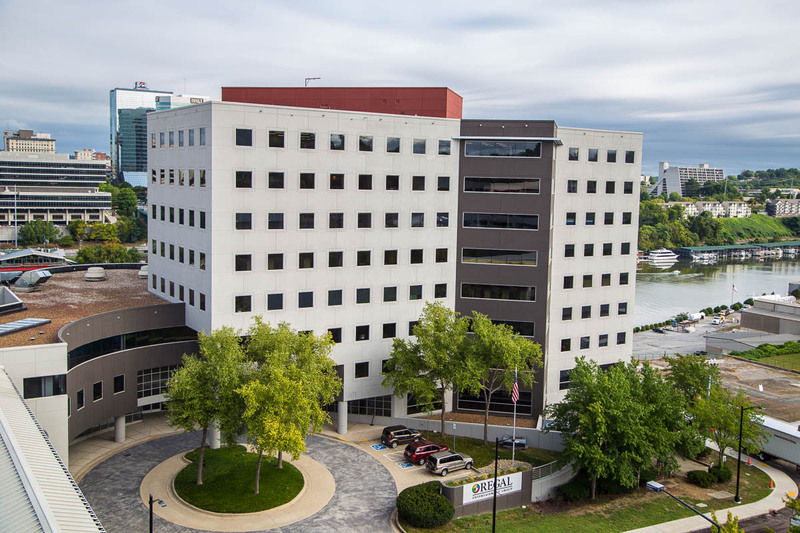 I have placed a call to Eric Vreeland, with the City of Knoxville, seeking comment and clarification of lease issues involving the Regal, or Project Hollywood, effort. Thank you for the additional details, Leland Wykoff! IMO the deal stunk from day one & I’ve yet to see anything to convince me otherwise. To add insult to injury the asbestos-laced (toxic?) debris was dumped in South Knox over the repeated objections of the local homeowners/residents. One can only wonder what sort of legacy THAT dumping will convey to future generations. As a child who once played on what would later become Superfund clean-up sites in South Knox County I’m NEVER confident the powers-that-be have looked out for our best interests. ESPECIALLY when money is involved. The crazy thing is, you can have whatever problem you want with the whole thing. However, plans are always made and constantly change. Also, if you haven’t noticed, the construction of a new southern waterfront has been and is inevitable.